This article was originally published in Hopkins Medicine magazine, Spring/Summer 2018. Click here to access the original article. Caring for severely ill patients is never easy. But on certain days, the anxious grind turns into something worse. A doctor misplaces a decimal point in a chemotherapy order, no one catches the error and the patient receives the wrong dose. A nurse witnesses a horrific act of violence between a patient and his family members. The sudden death of a patient after weeks of intensive care leaves an entire unit’s staff in mourning. After incidents like those, several systems swing into action at The Johns Hopkins Hospital: Patient safety officers and medication safety committees will examine how that wrong dose made it all the way to the bedside. Security officials and social workers will consider how to de-escalate and prevent family violence. The critical care service will review the ICU case and ask whether any treatment protocols need to be changed. But these incidents also demand a second kind of response: Someone must help physicians, nurses and other staff members regain their equilibrium after they experience trauma and grief. Since 2012, that has been the mission of the Resilience in Stressful Events (RISE) program—an all-volunteer effort that offers immediate peer support and “psychological first aid” to Johns Hopkins Hospital employees at any time of day or night. Since the program’s launch six years ago, more than 900 Johns Hopkins clinicians have been served by RISE. The program, which is one of the first of its kind in the world, aims to prevent burnout, despair and self-harm. It has won national praise, and its model has been exported to hospitals throughout Maryland and beyond. The mechanics of RISE are simple: The program comprises roughly 30 volunteer responders who are chosen through an application process and undergo 15 hours of initial training. The vast majority have been with the program continuously since its inception six years ago. The responders are divided into three teams, which rotate monthly. When a team is on duty, its members are responsible for responding immediately to employees’ calls. Depending on the type of call and the time of day, one, two or three responders might be dispatched. For nearly 30 years, Wu has studied patient safety and the prevention of clinical mistakes. In 2000, he published a widely cited commentary titled “Medical Error: The Second Victim,” in which he argued that hospitals do a poor job of helping clinicians work through the trauma and remorse they feel after they make errors. 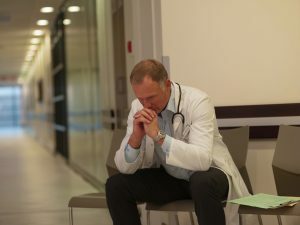 “In the long run,” he wrote, “some physicians are deeply wounded, lose their nerve, burn out, or seek solace in alcohol or drugs.” That syndrome of unspoken trauma, Wu wrote, makes it difficult for hospitals to build effective safety systems to minimize clinical errors in the first place. Several months after Wu published that essay, a devastating sequence of system and team failures on a Johns Hopkins pediatric unit cost an 18-month-old girl her life. Josie King was admitted to Johns Hopkins in January 2001 after suffering scalding burns at home. She initially responded well to treatment, but a few weeks into her admission, she began to decline. The clinical team failed to manage her electrolyte imbalances and also failed to note that she had become septic. She died on Feb. 22. The death of Josie King ultimately led to an enormous cultural change at Johns Hopkins. With the leadership of Peter Pronovost and other experts, the hospital began to empower doctors and nurses at the bedside to detect, report and correct hazards to patient safety. This work moved to a new level in 2011, with the creation of the Armstrong Institute for Patient Safety and Quality. One of the first people hired by the Armstrong Institute was Connors, who had been a nurse on the unit where Josie King was treated. Connors is deeply committed to building systems and protocols to protect patients like Josie. But she is equally committed to helping clinicians process their own pain after errors take place. In 2010, Connors and Wu discovered their mutual interest in the problem of second victims. They began to think seriously about how to offer immediate peer support to clinicians who feel badly stung by something they’ve done or witnessed. Johns Hopkins has an established, well-respected counseling program known as the Faculty and Staff Assistance Program (FASAP). But Wu and Connors thought the hospital could also use something nimbler and more informal: a volunteer peer-assistance squad that could arrive almost immediately after a clinical crisis. Drawing in part on the example of programs at the University of Missouri and the University of Illinois at Chicago, Wu and Connors proposed that Johns Hopkins create a volunteer group of peer supporters. They wanted a team that could offer confidential support at any time of day or night. The idea was not to provide formal counseling, but “psychological first aid” to help clinicians through the initial stages of trauma. For guidance, they turned to Johns Hopkins psychiatrist George Everly, who is an expert in providing psychological support in the aftermath of terrorist attacks and other crises. Once the RISE concept was in place, the team’s next task was to recruit volunteer responders. They wanted to identify people who were already known and trusted as having good shoulders to lean on. In the fall of 2011, the RISE program was piloted in the Department of Pediatrics. The following year, it was expanded throughout The Johns Hopkins Hospital. One person who became a strong supporter of RISE after he saw it in action is Sanjay Desai, director of the Osler Medical Housestaff Training Program. A RISE encounter begins when a clinician contacts the service and asks for help. Between 15 and 20 percent of the time, the encounter is handled purely by phone. But in the majority of cases, the employee wants an in-person conversation. The team’s goal is to have a responder present at the site as quickly as possible. (In some cases, the callers say they’d prefer to meet with a RISE responder after the end of the shift.) If the employee wants privacy, the meeting might take place in a conference room outside the unit. If the employee prefers to speak to a RISE responder from their own field—a fellow doctor or a fellow nurse, for example—that can sometimes be arranged. Some RISE calls come from doctors or nurses who feel anguish because they have committed a real or perceived error. Others come from clinicians who simply feel sharp grief or distress after a patient’s death, even if there was no apparent error. More than half of the time, a RISE responder works with a group of clinicians, helping entire units to process their feelings after a loss. “When physicians call RISE, it tends to be either because of an error or because they’re feeling moral distress,” says Wu. “For example, they may feel that they’re being asked to give intensive, futile care to a patient with a very poor prognosis.” Nurses, by contrast, are more likely to call because of feelings of grief. One of Wu’s major goals is to increase the number of physicians who are skilled in providing peer support—even if they don’t become full-fledged RISE volunteers. Of the 35 current RISE responders, the vast majority are nurses. Only two—Wu and Razzak—are physicians. Wu and others are actively working to recruit additional physicians, but it has been a challenge, he says. Residents have intense clinical responsibilities, and attending physicians feel stretched thin by their teaching, clinical and research obligations. But even if residents can’t serve as official RISE responders, Wu and others want to ensure that they acquire basic skills in peer support so they can informally help colleagues in crisis. In fall 2017, a small-scale experiment began: Connors recruited eight medical residents and offered them a condensed version of the RISE training. That small cohort has met monthly with Connors and Laura Hanyok, director of the Resident Continuity Clinic at Johns Hopkins Bayview Medical Center. During those meetings, they discuss the clinical traumas they’ve seen and the informal support that they’ve been able to offer their fellow residents. “In a few cases, there really seems to have been a new kind of sensitivity to what their peers are going through,” Connors says. Next year, she and Hanyok hope to offer the same program to a larger pool of residents. Meanwhile, the RISE program itself continues to grow. At least five other hospitals in Maryland have adopted versions of the program, with financial support from the Maryland Patient Safety Center. Wu has helped hospitals establish RISE-style programs in locations as far-flung as Texas and Belgium. For more information on RISE, click here.